With half-term fast approaching, Flame & Thunder at Santa Pod Raceway is the perfect cure for those holiday blues! This show stopping season finale provides fun for all the family with an action-packed timetable of Drag Racing including a 300mph Top Fuel Dragster, Stunt Shows featuring legendary driver Terry Grant, the mighty ‘Podzilla’ and ‘Swamp Thing’ Monster Trucks, no less than six scorching Jet Cars, daredevil drifting from Team Maximum Lock plus static displays from a variety of motoring machinery. Get involved – don’t just sit on the side lines, there’s plenty to partake in from driving Mini Monster Trucks, being a passenger in the 10 seat Red Dragon Monster Truck, interactive circus workshop Circus Whiz, helicopter pleasure flights and a kids Halloween disco. A Star Wars themed stage show Force Academy featuring Jedi training takes to the Live Stage in the ultimate battle of Good vs Bad! Or if magical fairytales are more your thing, Princess Show Time will be performing all the classic songs from your favourite fairytale. As dusk falls, keep yourselves warm as the Jet Peugeot 205 lights the bonfire which will blaze all evening long. Keep your eyes to the skies as the sensational Fireflies Pyrotechnic Aerobatics Display Team put on some aerial entertainment. And of course, it wouldn’t be Flame & Thunder without the climatic fireworks finale which will be triggered by the FireForce Jet Car as it blasts down the track in a pyrotechnic chase! With cheaper advance price tickets ending at 5pm on Friday 20th October, now is your last chance to book a day out with a difference! To book or find out more please visit www.SantaPod.com. Buy now for just £4 per person and get a prime view of all the track action. Plus you will avoid the queues on the day! Don’t worry if you have already bought your admission tickets, you can still book your seats online! The fifth annual Junior Drag Racing Fun Day at Santa Pod Raceway is just days away!! This FREE fun day takes place on Thursday 24th August and there is a huge line up of fun and frivolity for all the family. Taking centre stage will be the dragstrip where the next generation of Drag Racers; the juniors, will be competing in some friendly rivalry. The incredible FireForce Jet Car will be blasting its way down the quarter mile at over 270mph in 5 seconds! There will also be demonstrations runs from supercars supplied by event partner The Sharnbrook Hotel. Ensure you head over to the Live Action Arena and catch stunt rider extraordinaire Lee Bowers in action as well as Santa Pod’s resident Monster Truck Podzilla. The Red Dragon Monster Truck will be offering passengers rides for those looking for a little adrenaline. Other family activities on the programme include dodgems, trampolines, face-painting, bouncy castle, craft corner plus trade stalls and a state-of-the-art race-driving simulator provided by Santa Pod’s Fun Day partner, the Milton Ernest-based multi-activity adventure site Twinwoods Adventure. Voluntary donations to The Helping Harry Trust will be welcomed during the day. Tickets are subject to availability and must be pre-booked so book today via www.SantaPod.com or call 01234 782828. Click here to view the timetable. PLEASE NOTE! There are roadworks which will close Wollaston Road in Irchester from 23rd – 25th August 2017. 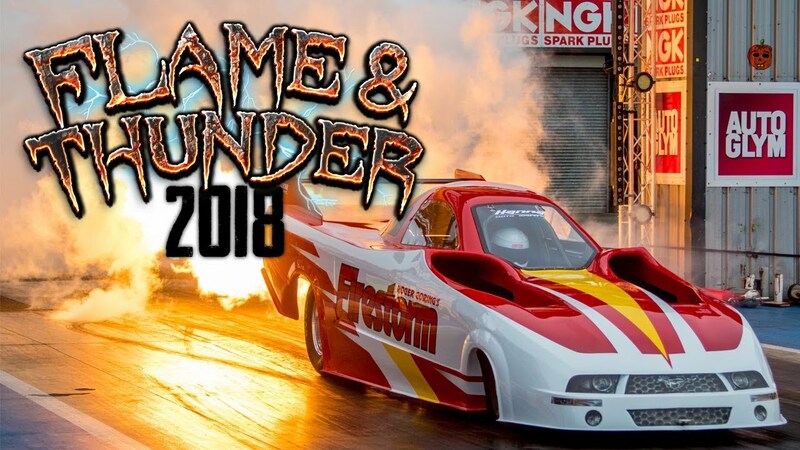 Flame & Thunder brings Santa Pod Raceway’s 50th Anniversary year to a close. But before we bid farewell to the 2016 season, we have just one last blast of drag racing action lined up. It wouldn’t be Flame & Thunder without a roaring bonfire and firework display but before we get to the whizz, pop, bangs, there’s a chockablock itinerary of fun and frolics for all the family. Track action features a myriad of Jet vehicles, Liam Jones in his Top Fuel Dragster, Wheelie Cars and the World Record Breaking Rocket Bike. The Live Action Arena will host of throng of stunt masters including Team Maximum Lock drift displays, Lee Bowers Stunt Biker, Monster Trucks, Car Football and even a Jet Peugeot! With oodles of entertainment including live music and a kids Halloween disco, Flame & Thunder is the perfect way to end the half term holiday. Day tickets are available from just £20 per adult and kids under 16 go FREE! To book or find out more please visitwww.SantaPod.com. We still have places available for VIP/Hospitality at Flame & Thunder. For just £99 + VAT per person come along and enjoy the VIP experience including lunch and balcony viewing. Don't worry if you've already booked your tickets, you can still upgrade for a great day out or a gift. More information on the Hospitality Page. With Easter just around the corner, Festival of Power preparations are well under way. A full timetable is available to ensure you don’t miss a thing. If you haven’t yet bought your tickets, there’s still time. Simply visit the online ticket shop where you can purchase your tickets and have them emailed straight to you via the ‘Print at Home’ email service. Remember kids aged 15 and under go FREE (max 3 per adult). Go to the online Ticket Shop to book and print yours now! Santa Pod is an outdoor venue so please bring warm and waterproof clothing with you in case of inclement weather. Check that you have your tickets with you (if bought in advance) and hold on to these tickets, even once in the venue. We highly recommend that you have a camera to hand to capture those memorable moments! Remember that the clocks go forward one hour on Sunday 27th March at 1am. We would hate for you to be late for the action! 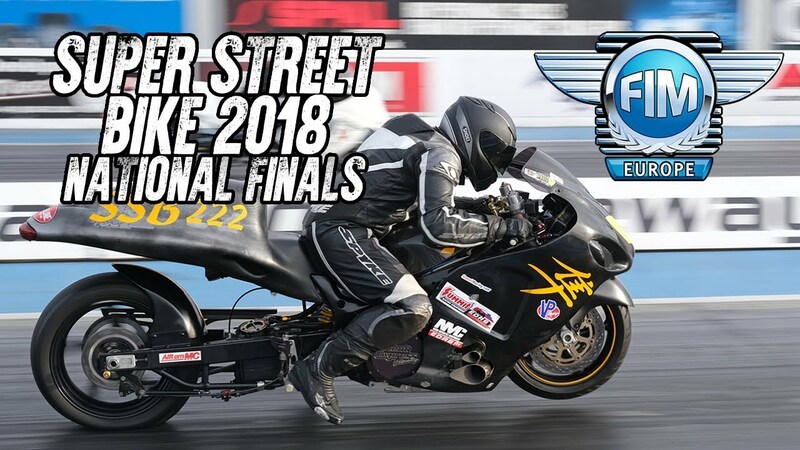 Santa Pod Raceway have teamed up with the guys from Fast Bikes and Back Street Heroes magazines to bring you a brand new motorbike festival celebrating everything on two wheels. As always at Santa Pod, the drag strip is at the heart of the action with Run What Ya Brung, Straightliners Drag Racing, Wheelie Competition, Jet Car and more. The action continues off track too with monster trucks galore including Podzilla, accompanied by Red Dragon and the Mini Monster Trucks. Steve Colley will be wowing the crowds with his trials bike show and there’s a full round of the British Stunt Bike Championship. The Rock in the show will be provided by six man AC/DC tribute band "LiveWire" who will undoubtedly set the Saturdayevening alight. Those are just a few highlights from this new all action event. Weekend tickets are available from just £23 per person, to book or find out more, visit www.racerocknride.com. 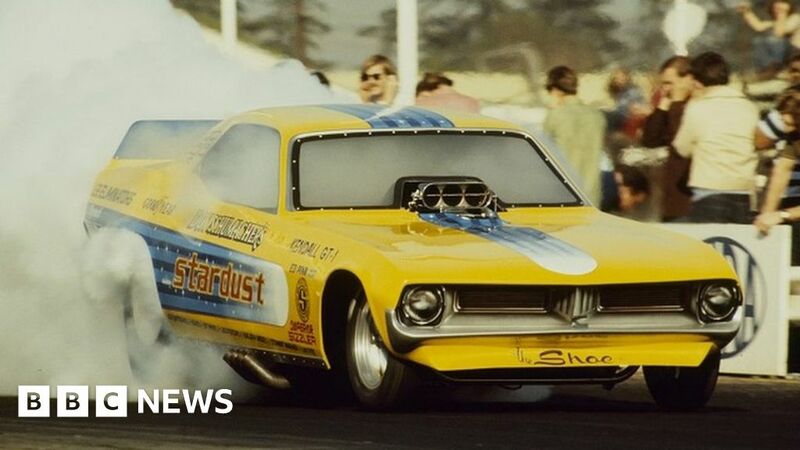 Kicking off the 50th anniversary year, Santa Pod’s Festival of Power is a marvellous concoction of intense, pedal-to-the-metal championship drag racing and full-scale family entertainment. Don’t miss the start of the National Drag Racing Championships plus the annual Jet Car Shootout, blasting forth its special brand of flame, smoke and thunder. Making its track debut and completing the quartet of jet vehicles, Martin Hill’s FireForce 4 Jet Funny Car will be unleashed in all its glory! Race Day Hospitality at Festival of Power allows you to be at the heart of the drag strip action with the best seats in the house, hot buffet lunch, refreshments throughout the day, souvenir gift, complimentary show guide and earplugs! All for just £99+vat. Experience the G-Force of a 1,000bhp dragster first hand with a passenger ride in Santa Pod’s newly liveried Two Seater Thrill Ride Dragster. As you’re strapped in directly behind our professional driver, you will be catapulted from 0 – 170mph in just 8 seconds! This thrill ride can only be experienced at Santa Pod so makes the ideal gift for adrenalin junkies. Package includes one days’ VIP Hospitality for 2 people and passenger ride for one. For more Two Seater information, visit www.santapod.com or call (01234) 782828. Here is your last chance to win an amazing Remote Control Truck Kit and free tickets to Santa Pod’s Festival of Power event this Easter! Courtesy of Santa Pod and Tamiya, you could be the lucky winner of this amazing prize bundle – worth over £650! This amazing truck kit comes complete with radio control system, speed controller, battery and charger – perfect for kids and big kids alike! All you need to do is text POD TRUCK to 60163 and we’ll be picking a winner at 3pm on Friday 18th March. Winner will be contacted by 4pm via mobile number supplied an must be available to attend the event for the prize presentation. GOOD LUCK! An action packed day with monster trucks, stunt shows, car jumping, drifting, mini monster truck rides, fun fair rides & all round damily fun. If you haven’t already booked your tickets, save £££’s now and book your advance price ticket before 5pm on Friday 12th February for just £9 plus fees and of course kids under 13 go free too! To make your day extra special, why not book a VIP Ticket and bag yourself prime viewing and hot refreshments. Adults - £40 per person and kids - £20 each. To book or find out more, visit www.stuntfest.co.uk or call 01234 782828. An action packed Easter weekend for the whole family! BLACK FRIDAY – UP TO 50% OFF! For our 50th anniversay get 50% off all Festival of Power admission tickets* including a single day Mid-Track VIP package! Offer starts 9am tomorrow until midnight Sunday. *excluding grandstand tickets. Fees apply. (excluding fuel, tools and gift vouchers). For one day only - grab a bargain! Flame & Thunder - Cheaper Tickets! Santa Pod Raceway announces it's 2016 events! Video - The NEW Galdiator ready for the return of the European Funny Car Series next season. The NEW Galdiator ready for the return of the European Funny Car Series next season. Video - The NEW Gladiator ready for the return of the European Funny Car Series next season. The NEW Gladiator ready for the return of the European Funny Car Series next season. Video - We've got your back! Photo - If you don't have this in your living room, you're doing something wrong! If you don't have this in your living room, you're doing something wrong! Video - Our Cyber Monday Sale is now on! Our Cyber Monday Sale is now on! Video - Its Black Friday! Get your Santa Pod Raceway Deals NOW! Video - Our Black Friday Sale Starts this Friday! Our Black Friday Sale Starts this Friday! The Fast Show Reloaded at Santa Pod Raceway, the first performance and modified car event on the calendar. Parts of the car were due to be sent abroad for a £150,000 restoration project. My Friend: Drag Racing is just cars going in a straight line. Today we are fans of Motorsport not just drag racing as we wish her a speedy recovery. Anyone with information should contact Santa Pod directly on info@santapod.com or call Bedfordshire police on 101 quoting crime ref No: 40/37089/18. Photo - Now THAT is a cool cake! Now THAT is a cool cake! Video - We cant wait to see you all at our stand! We cant wait to see you all at our stand! Keep up to date with Retro Show 2019 via our Facebook Event Page. Photo - We've made it to the NEC Classic Motor Show! We've made it to the NEC Classic Motor Show! Who's gonna be with us Tomorrow? Starts Tomorrow and the Weather is looking great!